My Great Great Grandfather, Frank Cleage, was born around 1816 into slavery, in North Carolina. By 1834, Frank was enslaved on the plantation of Samuel Cleage in McMinn County, TN. 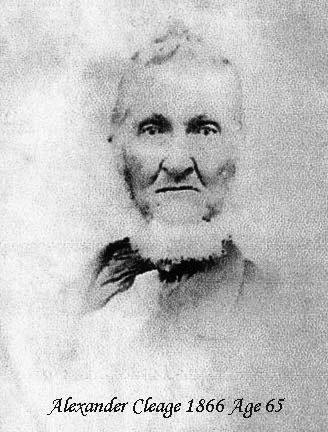 Samuel Cleage and his traveling group of family and slaves passed through North Carolina moving from Virginia to Tennessee in the 1820s. Perhaps he picked up Frank as payment for one of the fine brick houses he sold along the way. After Samuel’s death, Frank went to his son, Alexander Cleage, as part of the estate. 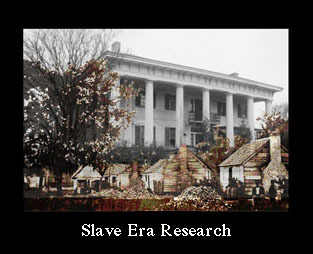 The photographs of the slave owners came from my cousin. I do not know their original source. I do not have a picture of Frank Cleage and have no stories about him. I decided to use a photograph of my Grandfather Albert B. Cleage Sr and his siblings – the first generation of black Cleages to be born free, next to some of the bricks from a Cleage building, built during savery, in McMinn County as the header for this story. 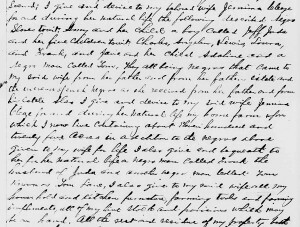 The earliest mention I have of Frank is in a work agreement between Samuel Cleage and his overseer in – “Article of Agreement – 1834“. It includes the paragraph below which mentions Frank. Click on any of the images below to enlarge. Click on links to see full document. 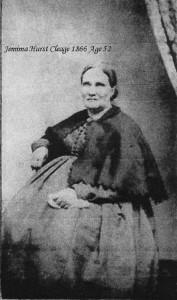 My Great Great Grandmother, Juda is first mentioned in the Will of Jemima Hurst Cleage’s father, Elijah Hurst. He gave her 4 slaves, including Juda. Alexander Cleage and Jemima Hurst married November 22, 1832. Juda and Jemima would both have been about 19 years old. Although I have found no record proof at this time, I believe that Juda and the other slaves were part of Jemima’s dowery. Frank is mentioned again in the 1852 Bill of Sale after the death of Samuel Cleage and the division of his slaves and property between his children and wife. David Cleage, Walter Nutter and Elizabeth Cleage Nutter sold Frank to their brother, Alexander Cleage. 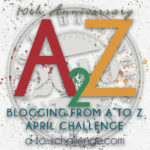 “Know all men by these presents that one David Cleage and Walter Nutter and his wife Elizaeth H. Nutter, have this day bargained and sold to Alexander Cleage and his heirs and assigns forever, Joe forty four years of age, Tom Eighteen, Lynd eleven, Frank thirty nine, Phillip forty, Lewis twenty six, Sam two, Martha twenty one, Lea thirty four, Julian forty three, Patey five. 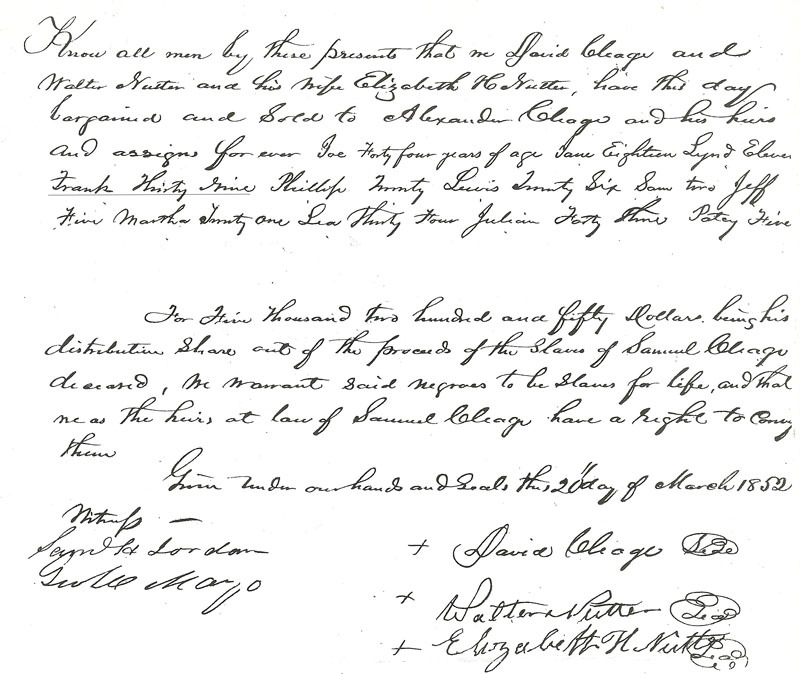 For five thousand two hundred and fifty dollars being his distribution share out of the proceeds of the slaves of Samuel Cleage deceased, We warrant said negroes to be slaves for life and that we as the heirs, at law of Samuel Cleage have a right to convey them. In 1860, Alexander Cleage wrote his Will. He leaves to his wife, Jemima Hurst Cleage, 13 slaves. Frank and his wife Juda and 5 of their children are in that group. Because he didn’t die until 1875, all of them were free before the will was executed. 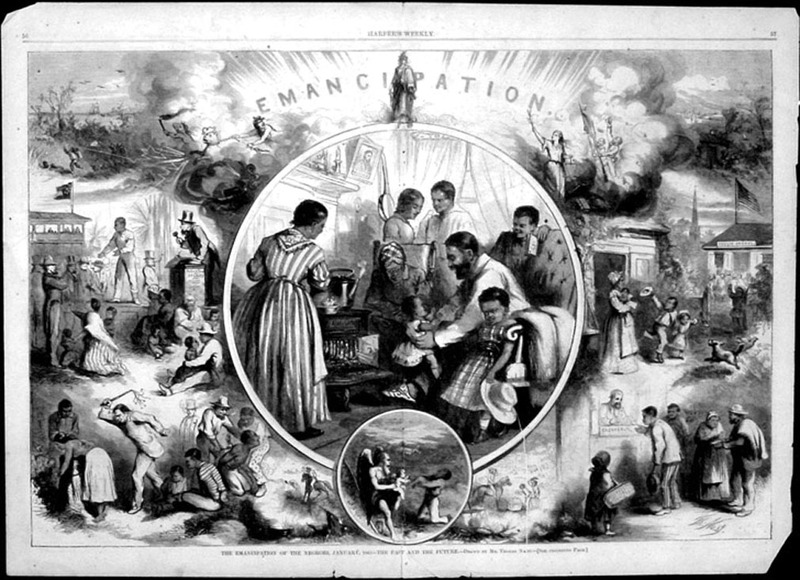 “The Tennessee State Convention have unanimously passed a resolution declaring slavery forever abolished, and prohibiting it throughout the State. 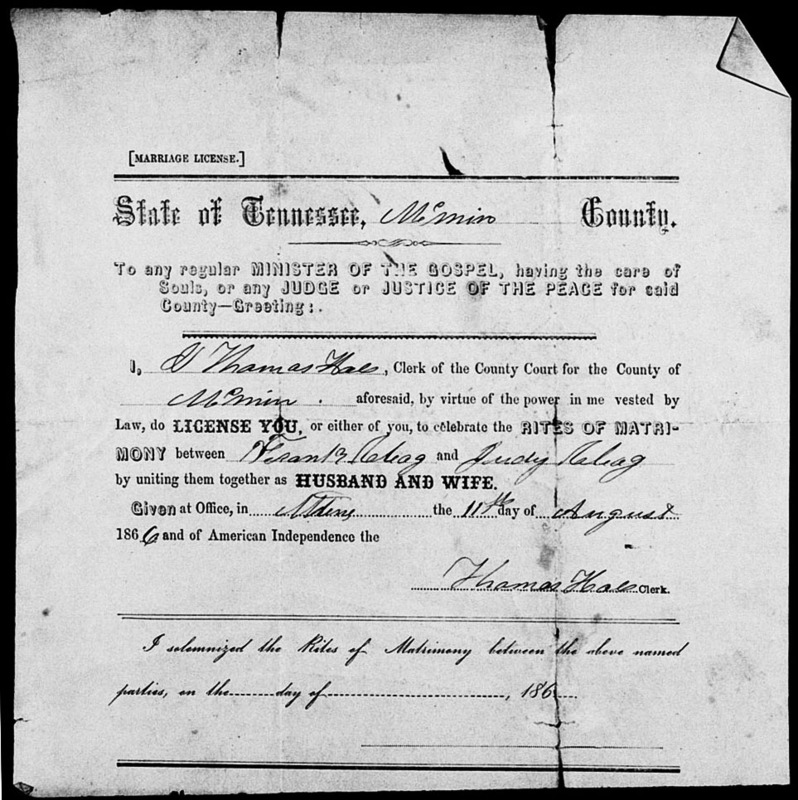 In 1866, soon after the end of the Civil War, Frank and Judy Cleage were legally married in Athens, TN. In the 1870 Census Frank was living with his wife, Juda and six children, including my great grandfather, in Athens, Tennessee. 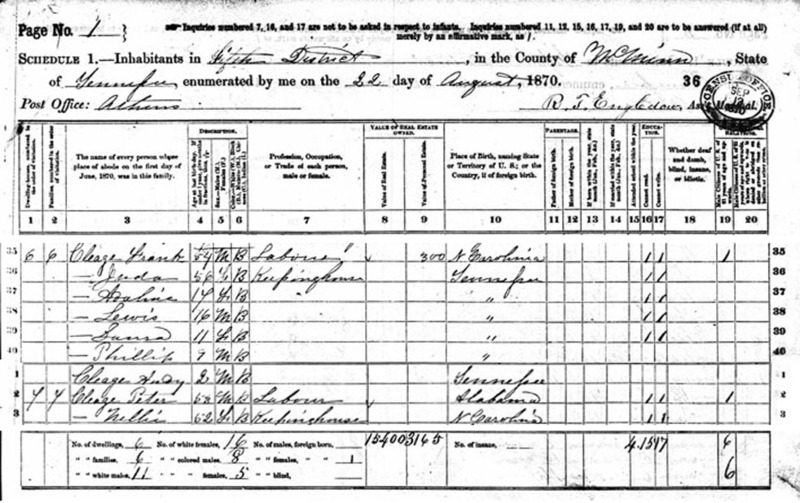 I had been looking for my grandfather’s father, Lewis Cleage and found this census record on Ancestry.com. 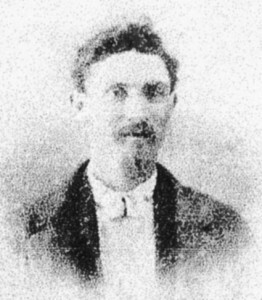 Although this Lewis was the right age, and there were no other Lewis Cleages anywhere in the right age range, I had no name for his father and relationships are not specified in the 1870 census. He could have been living with his uncle and aunt, I didn’t know. Frank, age 54, worked as a laborer, was born in N. Carolina and nobody in the household could read or write. Juda, age 56, was keeping house. Their personal estate was worth $300. Juda and all the children were born in Tennessee. The children were Adaline 14, Lewis 16, Laura 11, Phillip 9 and Andy 7. There was no Charles or Frank mentioned, although there was a Charles Cleage living elsewhere in Athens, TN, I don’t know for sure if he was the Charles mentioned as one of Juda’s children in Alexander’s Will. Aside from Lewis Cleage, I cannot find family members again after this census. Did they change their names? Die in one of the several epidemics of cholara and yellow fever that swept the county during the 1870s? Believe me, I’ve tried every permutation of “Cleage” and searched page by page the McMinn County 1880 Census and the one for Louden county, where I find Lewis and Celia and their children living in 1880. After searching a variety of spellings of Cleage, I was able to track Lewis Cleage from job to job and location to location up through the 1910 Census. I could find no death certificate for him. I finally found him living at the same address as his daughter, Josie Cleage and her family in Indianapolis, IN in 1918, while researching at the Indianapolis Library where I could check each Directory, year by year, on microfich. 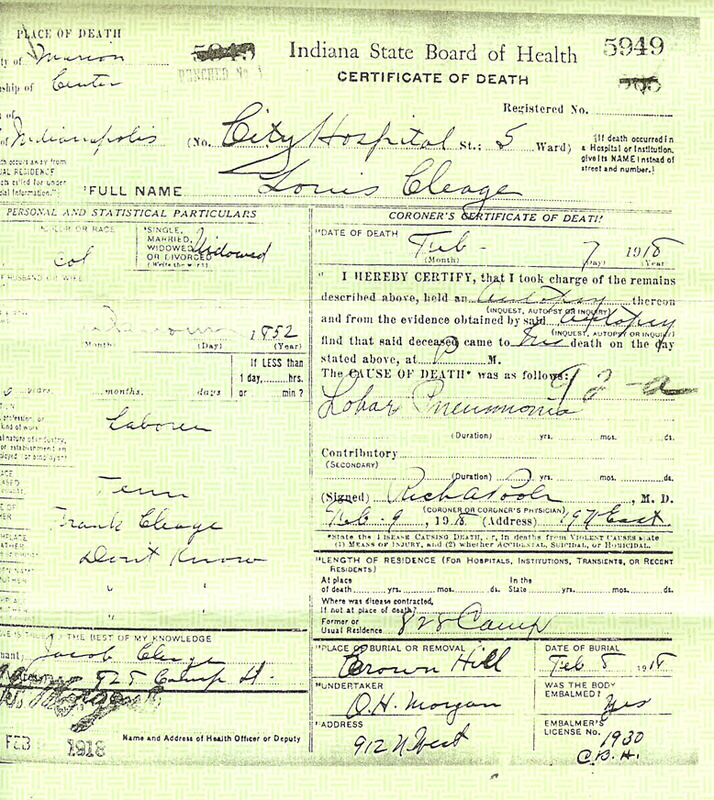 Frank Cleage’s name appears on my great grandfather, Louis Cleage’s death certificate. Jacob Cleage, my grandfather’s older brother was the informant. He did not remember Louis’ mother Juda’s name or where his grandparents were born. This, along with the Will of Alexander Cleage of 1860, documnted the names of my Great Great Grandparents, Frank and Juda Cleage. Excellent research skills…I am always pleased when a couple who began their relationship during slavery would legalize their relationship, a love that endured. Me too Linda. And a desire to be a part of the legal system of recognition they had been outside of their whole lives. Very interesting to read, so devastating that people could be owned and sold! Had practically no rights, did not have a chance to learn to read and write. Had to work hard for practically a pittance. Slavery was a holocaust for the people involved. Baby Sam was only two, when he was sold, so he must have been taken from his mother or his parents. It was an awful, disgusting attitude of the people who bought and sold others and thought they were their betters. Not even a pittance. For nothing. Most slaves made no money at all. BEAUTIFUL Kris! As descendants we’ve as much responsibility to preserve and share our Ancestors freedom stories, as we do to honor their slave experiences. They were far more than slaves & that part gives me the most pride. Their unbelievable strength. Oh but the look of the slave owners! They are not here to tell it, but I know those souls were hardened and tortured. That’s why they all seemingly look the same. They reflect a common wounded spirit. Thanks Luckie. My Turners in Lowndes County have been calling to me. I think they are ready to be found pre 1866. “Happy Hunting!” does not begin to describe what I’m doing. How wonderful & sad at the same time! To find such information and connect up the dots of your family is such a blessing. To know they lived through this experience is great and then officially married under State law when they could shows a yearning to live “normally” not as property. Blessings to you. It is a blessing, thank you. I signed up for the class too, although I haven’t yet had a minute to look at the video yet. Hope to get to it today. I can’t find the words to say how much emotion reading your story brings. Your research was very thorough and your story so well written. Some of the documents were tough to read but at least you have them and they hold information on your ancestors. 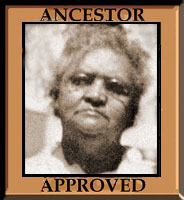 You gave your ancestors a voice and through that voice we see a strong committed family. The marriage says it all. Great job. Thank you for sharing your family with us. Thank Bernita. It is very emotional. Kisten this is so well written and documented. I’ve read only a few similar disertations but none so moving and well documented. I truly hope that I can one day walk in your shoes, follow your paths and bring my long forgotten ancestors to life. Thanks do much for sharing. Thank you Mary. Keep looking and following and you will find much more than you think! You have really done your work Kristin. So well documented! I hope to find this much information on my ancestors one day. Thank you for sharing. Loved the research Kristin! My Poor Lewis! He gave you quite a bit of a run! The documentation and photos are Wonderful. You pieced it all together so Good. I often wonder how many relatives did I lose in those epidemics? Look forward to the next piece! And this seems to have been before Tennessee was very good about death records. As always thoroughly and determinedly researched….a great example. I cannot read or hear of human beings bought, sold or bequeathed without grinding my teeth. I can’t imagine how it must make you feel. But how wonderful that they got their freedom and independent lives with their families!! I wonder if the family members did all die, but if not, where did they go? You know I am wondering the same thing, where are they or where are their death records??? Thank you, Kristin. Behind your clear, restrained account is so much hard work, and behind that, so much sorrow. But to this reader it is like magic, the way, through the painstaking research you bring your ancestors to life, and affirm their lives as well as those of all who have followed in their footsteps. Frank, Juda, and the rest of their children must have gone somewhere. I trust that if they can be found, you will find them! I’m hoping you’re right. They must be somewhere. And I’m going to look for them in several places. Kristin, I thoroughly enjoy reading about your family and learning from their struggles as well as the success stories! What remarkable research you have done and very well organized in your sharing approach as well! Thank you so much for introducing me to the Cleage family! Thank you Dante, for reading and commenting. This research is very meaningful you got something exciting goin on here! its great that you have been able to bring the lineage forward as far as possible. 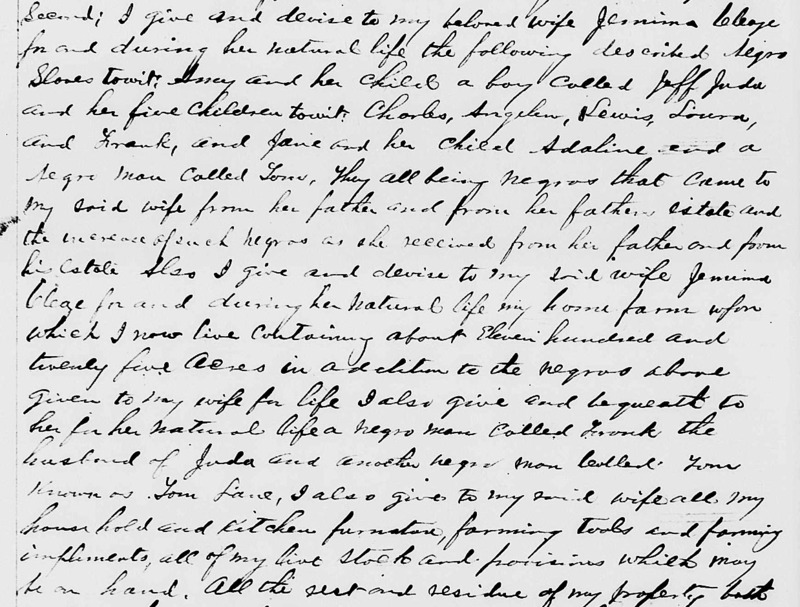 Hope that as you continue the research that it would include tracing back to Jeminia Hurst Cleage since the captives first belonged to her father, perhaps this might lead to whether some of the siblings/relatives remained with the Father and took on her father name. Is Hurst the maiden name for Jeminia and did she have any children. BTW I really like your hair do. I did quote Jemima’s father’s will up there (2nd quote), and provided a link to the full document. 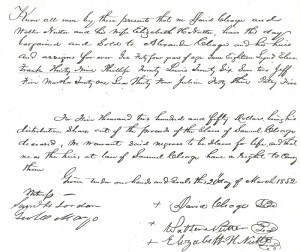 I would like to be able to see a probate record that listed all the slaves in his estate – hopefully by families so I could try and figure out who Juda’s family was. These records aren’t online for Tennessee at this point so I will have to actually go somewhere and see if I can find them. Jemima’s maiden name was Hurst. Her father’s name was Elijah Hurst. She and Alexander had 10 children. Freedom came before Alexander Cleage died.